“Schrimpfengut” is located in St. Michael in the middle of Styria, also called “the green heart of Austria”. Currently the live stock includes 50 cattles, two horses and some other animals, which are typically living in farms. 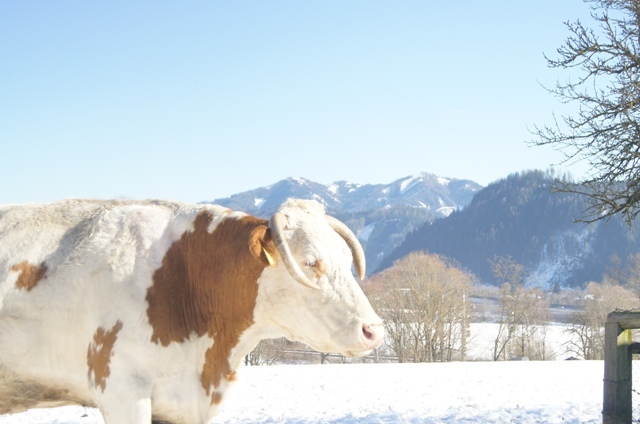 Since a few years we consecrate ourselves in breeding Simmental cattle. In 1992 we bought the farm and since then it’s run as a family business. One of the most important things at the beginning was the purchase of breeding animals. By and by we bought seven heifers at auction sales in Leoben. Two of them have been the basis of our todays breeding herd. Until now we just bought three other female breeding animals, for herd replacement we use the progenies of our own cows. The farm is cultivated in organic farming. In 2004 we decided to run a herd of beef cattle among the diary cow herd. The basis of our suckler cows have been muscled diary cows and heifers of those cows. Because of the big amount of female progenies of our suckler cows, we won’t have any problems to enlarge the beef cattle herd. 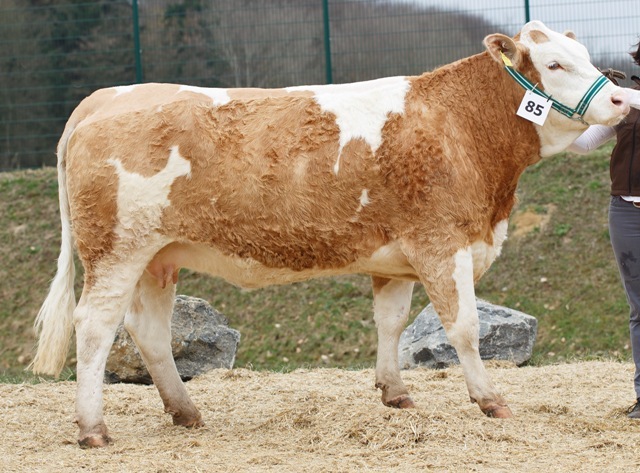 In 2009 we bought the first- and until now only- Charolais heifer (breeded by Maier Toni- Exploitation Agricole, Luxemburg). The suckler cows, their calfes, heifers and males are reared in a loose housing stable. In the daytime there is an outdoor run and there they got fed silage in a mobile feeding rack. From May until November the cattle are driven to the summer pasturing. The fields are nearby the shed, so it’s easy for us to control our animals every day and to show them to visitors. 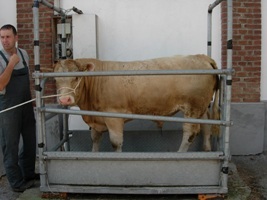 Most of the male calfes are castrated as soon as possible and the young bulls, after weaning, get to the station for performencetests, the ELP Kalsdorf. This allows us to keep the suckler cows and younger cattles all the year together in one group, so we can minimize the effort. In summertime the diary cows, their calfes and pregnant cattles are also kept all-day at the pastures. Since we don’t have a stock bull, we just use artificial insemination. So we have the opportunity to choose the optimal sire for each female. Until now we used bulls from Austria (GS Lazarus PP), Germany (Laki 2 PP, Poldau PP, Ursus PP, Bruno Pp, Steinadler PP, Bayer PP), Denmark (Gorm PP, Ronni PP, Lykke Atlantis Pp, Lykke Sirius Pp, Snaebum Campari Pp, Vellev Burk Pp), Hungary (Indianer Pp), UK (Banwy T-Rex pp, Kilbride Farm Newry pp, Dirnanean Telstar Pp, Dirnanean Apostle PP and Pasturefields Turbo Tommy PP) and the Czech Republic (Atlas PP). Young bulls, selected for breeding, get performancetested at the ELP Kalsdorf. Most of the male calfes are castrated as soon as possible. The bullocks are sold after weaning. When we started breeding Simmental getting a polled herd was an important goal. Beside the demand for polled (preferably homozygous polled) breeding cattle, animal wellfare is another reason for breeding polled cattle. But we use horned sires (both from other beef Simmental populations and dual purpose bulls) as well. Polled Simmental is an important goal for us, but it does no good to subordinate everything to such a goal. Our stock consists of 20 cows (partly still dual purpose Simmental for dairy production and partly of suckler cows), and their female progenies. On the right side you find a list of our current pedigree beef cattle.